Terrorists need money—and they need to move money. They might exploit our international banking system to move money around the world to finance their activities. Or they might launch a physical or cyber attack against our banking system, freezing the payments system and ATM networks so we cannot access our money for several days—bringing the economy to a grinding halt and wreaking havoc. Or, worse, they could try to engineer a financial crash of the type we have just experienced—costing trillions of dollars and millions of jobs. Keep track of credit cards, debit cards, etc. Many of us take advantage of store credit cards (10 percent discount if you apply for our card) with no intention of ever using that card again—which is fine, but do not just throw the card in a drawer and forget about: make sure you cancel the card, then physically destroy it. Check your bank/credit card statements for anything suspicious. A smart terrorist will not use your account for huge transactions that will be spotted right away—s/he will disguise their large transaction in many small pieces, each of which can slip under the radar screen. Be careful of “phishing”—fraudulent messages pretending to be from your financial institution.There are rising numbers of cases of “phishing”—phone, email or text messages that pretend to be from your bank/credit card company about some problem with your account. The fraudsters ask you to click on a link or reply with information about your account number, password, etc. Often, it is very hard to distinguish the real website from a fake website that is collecting information from you. If you receive such a message, do not respond to it! Instead, call your financial institution (preferably your local bank branch) on their listed number—not the phone number/email provided in the message to you. Never, ever give out your financial information—especially in response to dubious emails from places like Nigeria that promise to give you millions in exchange for a “modest” upfront expenses fee. Know who is getting your money. There have been instances of so-called charities funneling money for nefarious purposes. Are you sure you know what your money is being used for? At the very least, check the tax-exempt status of the charity/non-government organization you are donating to. Of course, 99.99% of charities are legitimate, but it only takes one terrorist to ruin your (and everyone else’s) day. Do not rely solely on electronic records at the bank—keep your own soft or hard copy records also. If your bank’s financial records get wiped out, they can probably be restored by backups—but who knows how long that might take. In preparation for the Y2K bug, we were advised to keep paper records of bank statements, etc. Everyone should keep at least 3 years of financial records in backed up (e.g., DVD or paper) form. Always keep some emergency cash/travelers checks at home. Do not keep too much cash at home, as there is always a risk of robbery, but do keep enough cash (or travelers checks—remember to keep the numbers in a separate place) in a safe place so that you could survive at least 3 days without being able to access your bank account/ATM. When traveling, keep some emergency cash and preferably two credit cards. On Sept 11, 2001, I was flying back from London—and ended up getting diverted to Halifax, Canada for a week (many thanks to our Canadian friends for their kind and generous hospitality). For the first couple of days, I had trouble using my ATM card. Ever since, I always keep emergency cash and two separate credit cards when traveling. This is probably the scariest scenario—since the effects could be much larger and longer-lasting. Terrorists have seen how vulnerable the US and the global economy can be to disruptions in the financial system—the financial crash has cost trillions of dollars and millions of jobs. As explained in Nineteenth Street, NW, such crises would likely originate in countries/financial centers that are vulnerable because of problems with their banks (bad loans), because they have too much public debt, because they have real estate bubbles etc. Because the global financial system is so interconnected, problems in one place can have severe repercussions elsewhere. And even if we do not make investments in “exotic” countries, through pension plans, stock ownership in US companies that have foreign links, etc., we might have exposure that we are not even aware of. Become educated about financial crises—how they happen, where they may be likely to occur, what the repercussions could be. Americans have seen that they are by no means immune to financial crisis—and obviously if you are investing internationally (or investing in a US company that has international linkages) it is vital to be aware of the risks. Remember, financial terrorists could initially target a vulnerable economy/financial sector, and then leverage up the ensuing chaos. Access publicly available information on the state of the economy and financial system in different countries—anyone thinking of investing internationally should at the very least check out sources such as the International Monetary Fund (www.imf.org), which produces an annual report on virtually every country in the world. Other IMF publications such as the World Economic Outlook and the Global Financial Stability Report are also excellent sources of information. Get a copy of Nineteenth Street NW! Most of the information on financial crises is written for specialists and is full of econ and finance jargon. 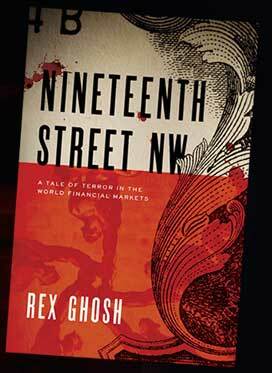 That is why I wrote Nineteenth Street, NW, to be an accessible source of information about financial crises. Written as an exciting thriller, this novel nonetheless explains the intricacies of financial crises—how they come about, what might trigger them, and what can be done to prevent them. The afterword essay goes into greater depth and contains an extensive bibliography for anyone who wants to delve into more detail on this topic. Financial crashes and financial terrorism can affect us all—in a democracy it is only right that we should all be educated about them.